In case you’re not aware, slow cooking is all the rage right now. And given the fast-paced, busy lives most Americans lead, it makes sense why! You just dump ingredients in a pot, go about your business, and then have a nice meal ready when you are. Well get ready folks…because this is quite possibly the BEST meal I’ve ever made using my crock-pot! This dish is SO filling and rich and just oh-so-amazing. Like all crock-pot meals, it’s super easy. You just toss in ingredients, and let it do it’s thing. I think I’m developing a love affair with cheese tortellini. It’s that good. 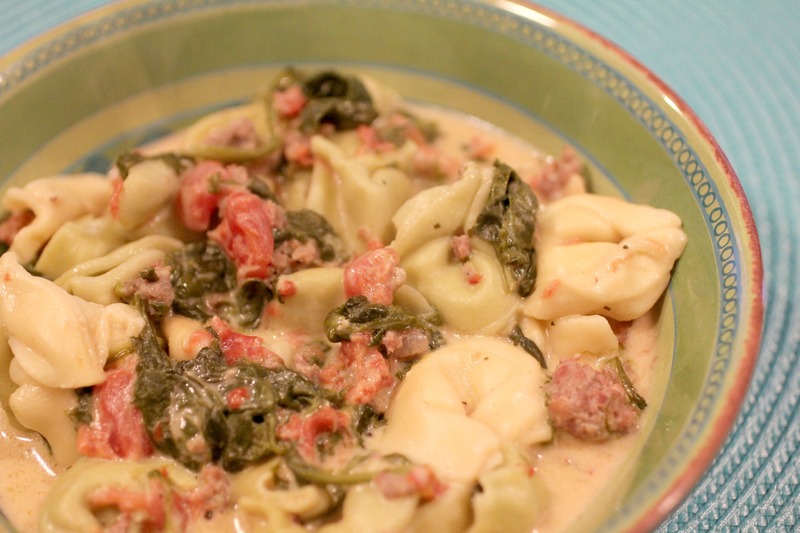 The sausage, spinach, and tomatoes just give so much flavor to this soup! The cream cheese makes the soup base thick and creamy. This is the perfect meal for a cold night, or really ANY night. I had these leftovers for 3 lunches in a row, and still didn’t get tired of it. Your family will LOVE this! Put all ingredients in crockpot, breaking the cream cheese into chunks. Cover and cook on low for 3 hours. Uncover, stir, and cook for 1 more hour. This looks simple and delicious! I can’t wait to try it My husband will love it! You know how men are about sausage! Thank you! My husband and I couldn’t get enough of this stuff! I hope the two of you like it as much as we did! This looks awesome! Gonna share it on Pinterest! I made this yesterday for my husbad and two adult sons. We were setting up our boat canvas shop in snowing and blowing conditions All of us enjoyed it I only used 1/2 the cream cheese My husband only eats cream cheese in cake He still doesn’t know. I agree with you on the cream cheese After 40 years of cooking for him I have learned not to reveal the ingredients. LOL. Thanks Lesley! As soon as the weather cools down here, it will be on the menu again! I need to make it again sometime soon! Glad you liked it! What if I can’t uncover for the las hour? Has anyone left covered? You can most definitely leave the lid on the last hour. It will just be more soupy. I wanted mine to be thicker and creamier so I left off the lid, but that’s definitely a preference. It will be good either way! Should the tortellini be fresh or frozen? Can’t wait to make this! I used the refrigerated kind (because that’s all my store carries), but I’m sure you could use frozen too. That’s one of the great things about slow-cookers is you don’t even have to defrost ingredients! The only thing is you might need to adjust the cooking time. Just test the tortellini and make sure they’re fully cooked. I used chicken Italian sausage, whole wheat tortellini, 3/4 of 8 oz reduced fat cream cheese. This was fantastic! I left the lid on the last hour and the soup still thickened. It was more of a stew rather than a soup. You may want to make adjustments if you are wanting more of a soup like consistency. Thanks for the tip, MaryEllen! Glad you enjoyed it! love this .made it many times .played with it a lot and its still always delicious . Thanks Andre! This is one of my favorite recipes. Once the weather turns cold again, it will be one of the first things I make! Thanks Kim! So glad you like it! I’ve never done it on the stovetop before, but I think I’ll try that next time! Oh I love the thickness of this soup! But I can see how others might like it a bit more “soupy”. Glad you liked it!